Children on the Autistic Spectrum often have difficult relationships with food. Elouise has co-authored a book looking at how a gluten- and casein-free diet can support a Gluten and Casein free diet, find out more about the book below. In the Autism Food Club, her primary role is creating recipes which are gluten- and casein-free and providing advice for following this type of diet and feeding issues. Elouise also provides monthly features for the Autism Parenting Magazine. For support on strategies to support eating please contact us to discuss. The Purpose of The Autism Food Club is to provide practical implementation of dietary intervention. The organisation aims to turn scientific research around food and diet into tasty plates of food for the whole family with a specific focus on the autism spectrum & related developmental conditions. Although targeted at the autism spectrum, anybody will benefit from these fantastic recipe ideas and simple scientific explanations. 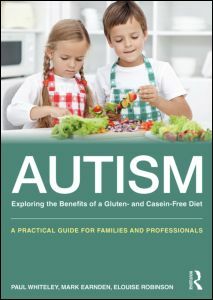 “Autism: Exploring the benefits of a gluten and casein free diet; A practical guide for families and professionals” is published by Routledge and available to purchase now. We aim to provide people with an autism spectrum condition, teachers, professionals, parents and caregivers of people with autism embarking on a Gluten & Casein Free (GFCF) dietary intervention a complete and readable overview of the science behind the GFCF diet and how that science can practically be translated into tasty recipes suitable for all the family.